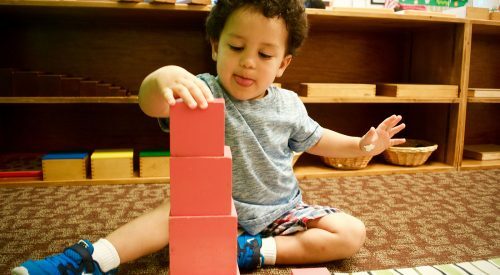 The Transition Program at Rockbrook Montessori Academy provides a continuation of the atmosphere, activities and expectations from the Beginner Program. 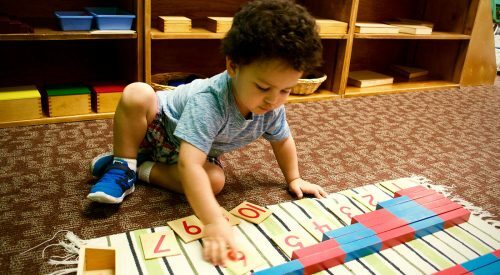 We focus on fine motor development activities with activities such as copying and tracing letters and numbers with crayons to strengthen little hands. There are also plenty of opportunities to draw, color, write, pinprick, and cut, thereby following the children’s interests as well as giving us a chance to encourage good techniques such as proper grip and posture. At this age we encourage self-help skills by showing children how to remove and hang up their own coats and backpacks, unpack their own lunches, and clean up their workspaces. We work directly with children and their families to address issues such as toileting problems, separation anxiety, shyness, and other challenges many children faced in early childhood. We want our children to become more confident and independent in this stage of their life. Children move from the Transition to the Primary classes when they demonstrate certain capabilities rather than based on age alone. Each child’s advancement is based on his or her individual progress in order to personalize the journey. In addition to academic achievements, other skills that are considered are concentration, cooperation, ability to work alone, social and emotional development, and areas of self-care such as being potty trained and having the ability to dress and eat independently.